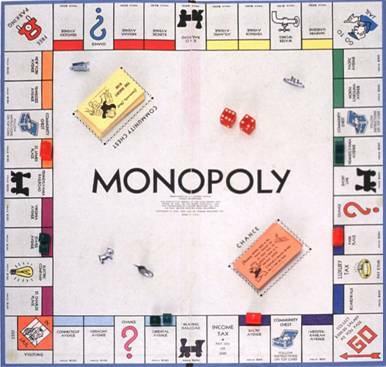 If you’ve ever played Monopoly you’re familiar with the streets of Atlantic City, New Jersey. Baltic, Atlantic, Ventnor, Park Place… the Boardwalk. All these places evoke some level of awesomeness, especially as you move around the board. Doesn’t Pennsylvania Avenue sound like a ritzy place to live? Way better than that trashy Vermont Avenue. I was in Atlantic City this week, and although I didn’t get to experience it in its full summer glory (assuming it’d be more glorious in the summer), the little bit I experienced left me underwhelmed. It’s a very small city, with the few large buildings being casinos/hotels or shopping centers. I heard from others that the streets surrounding the boardwalk were a bit slummy. Since I didn’t get out of the hotel much, my experience of the city really came via two taxi rides. The first was from the bus terminal to the hotel where I was staying. The driver was very nice, but every single emergency indicator was on – check engine, oil, etc. It felt a bit third-worldly. And he never reset the meter. It started and stayed at $13 the entire time. I paid. Oh well that a 6- to 7-minute taxi ride cost almost double the $7.30 I paid for the hour-long bus ride to Atlantic City. My second taxi ride, from the hotel back to the bus terminal, was also about 6 minutes. My driver was uninterested in conversing about the giant wind turbines near the waste treatment facility (I should’ve suspected then that something was up - who wouldn’t want to talk about sewage and turbines?! ), but later I realized he was actually just more interested in pretending he couldn’t speak English. It was a $12 ride, which I supposed was reasonable given the first ride. But as we pulled up to the bus station he left the meter running as he slowly grabbed for the receipt book and took my $15. I asked for my change - of course he didn’t hear or understand me. The 2nd time he reluctantly handed me $1.00. Then I said I should get $2.50, by which time the meter had actually ticked up to $13. So he very reluctantly gave me a second dollar back. At this point I abandoned all hope of getting correct change (or of ever desiring to return to Atlantic City) and went and bought my bus ticket. Perhaps I should’ve given the guy some extra money so he could fix his car. How on earth does one go about breaking the little door lock knobs?! So go ahead and visit Atlantic City – just be prepared for “Luxury Tax” instead of Park Place.